Soothing influences of abstr[act] beauty [are] more than ever wanted in these harassed modern days. The painter and sculptor, Sir Frederic Leighton (1830–1896), later Lord Leighton, was president of the Royal Academy, London, from 1878 until his death in 1896. The artist was born in Yorkshire, but traveled widely in Europe with his family in his youth. He was academically trained in Berlin (1842–43), Florence (1845–46), and Frankfurt (1846–50), where he studied with a Nazarene artist. In 1855 in Rome, he painted Cimabue’s Madonna Carried in Procession through the Streets of Florence (National Gallery, London), which was purchased by Queen Victoria from that year’s Royal Academy exhibition. Leighton completed his art education in Paris, where he absorbed Neoclassical tenets. After moving to London in 1859, he was at first given an unfriendly reception by the Pre-Raphaelites. However, supported by John Ruskin, he gradually gained acceptance. 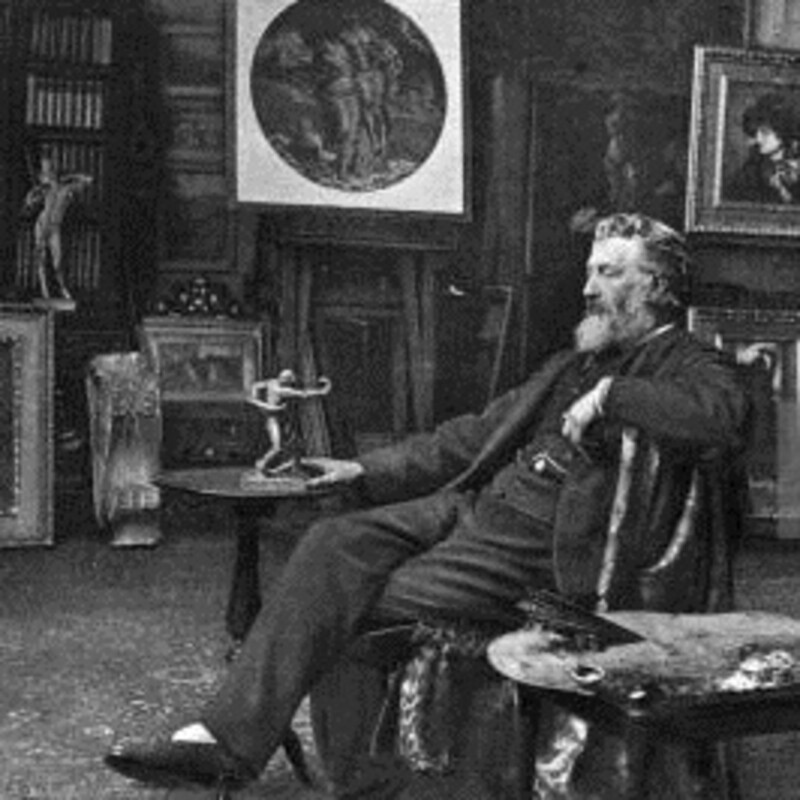 In London, he was at the center of the Holland Park Circle, a group including George Frederick Watts and Luke Fildes that led to a resurgence of interest in Classical art. Leighton developed an elegant style, rendering profound themes, often with a melancholy aspect, and depicting idealized figures in experimental drapery configurations. He frequently made small sculptural models for his paintings; in turn, his sculptural work evolved from the sculptural treatment in his paintings. A consummate aesthete and spokesman for the Victorian age, Leighton was a strong believer that art had to bring beauty back from the past, saving it from philistinism, and cultivating it before it was consumed by fiery forces of industrial England. Leighton’s London home is now The Leighton House Museum.